Being a Tomy Official Blogger means that we get to try out new toys all the time. Test them out for durability, style and fun-ness and the kids have a great time doing so. This time, we have been sent a range of items from the Tomy range of musical and moveable toys. Tomy are celebrating 20 years of expertise in infant developmental and creative play. They have a fantastic range of toddler toys, suitable for children from six months right up to three years old although Thomas is nearly 5 and still plays with them. This new collection that inspires playtime now falls under the Tomy Infant and Toddler Toys umbrella. There are new toys and a whole new look for the brand this year, including modern, vibrant packaging with more visible age grading, allowing the bright and colourful toys to really shout out on shelf. This new range launched in January and we were lucky to be sent 3 toys from this range. New for January is a counting toy called Luke the Loop. A loveable elephant in his own little plane, who loves looping and counting. In his little stunt plane the engine sounds, the propellers turn and as you rotate the plane around, it counts from 1 to 10. Designed for small hands to hold, it has a small handle on the top to make playing with it even easier and as the child makes a loop with the plane, it counts. It is an absolutely fab toy that both boys love playing with. The fact that they are having fun, getting to play and fly the plane around but also learning the basics of counting too. This one is probably the favourite of the toys and is also new to the collection. You simply push the giraffe’s head down and the engine starts. It rattles around as it's starting and then this cute toy rolls along the floor. The car vibrates as it revs and plays music and eventually shoots off. I love this toy as not only is it a great motion toy but for smaller children, it will help them in learning to crawl as they'll want to follow it as it moves aiding them in the process of growing up. This is the perfect toy to encourage follow-along fun for little ones. It has a ring-shaped body. making it easy for children to hold. You can simply push him down and release to see him roll forwards. The motion makes little ones want to follow along, encouraging movement, like the toys above, aiding the ability to crawl. If you push the turtle along the floor, you hear him ‘click’ as he moves and you can also shake him to hear a rattle sound too. I think that this toy would be perfect for children of a younger age as, it will help with learning to move around the floor but also the shorter, quiet sounds will keeps them entertained too. I am so privileged to be a Tomy Official Blogger and get to receive these items to test out. If you would like more information about them, or to see the other ranges they do, check out the Tomy Toys website. I love being outdoors, okay I prefer it when the weather is warm, but nevertheless, I love being outside. Being stuck inside is so depressing so we try to get out as much as possible, even if it's just into the garden. The boys love being out too, although they much prefer the getting muddy aspect of things. The only negative thing about going is, is the expense. I see a lot of advertisements for 'family days out' but once I research them, £300, £400, £500 later, I decide that we cannot afford to go. Recently, we have been out quite a bit so I thought I would write about what we have done, things that haven't cost a penny. Okay, okay, the holiday did cost us money, but I am talking about the actual activity. Going to the beach cost us nothing. You don't have to go abroad to get the good weather, the UK has some of the most amazing beaches around and when the weather is right, they are just perfect. 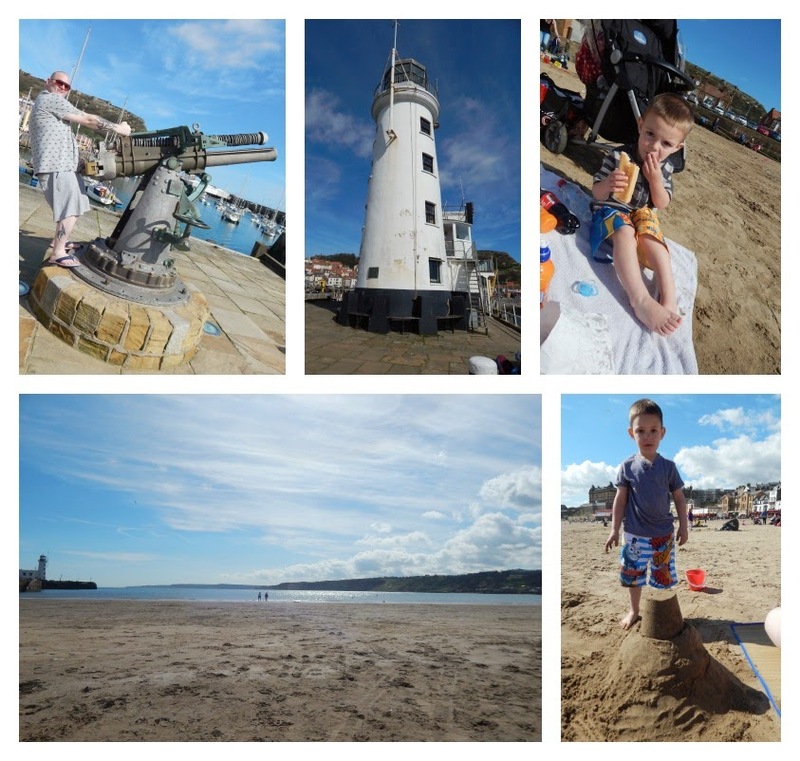 The amount of different things you can actually do at the seaside is immense. 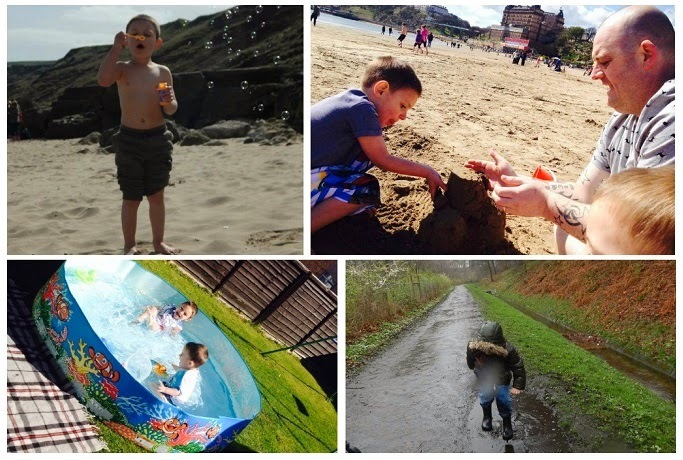 From, building sandcastles and burying daddy in the sand to paddling in the sea and blowing bubbles into the breeze. Everything is free, fun and fantastic. If the weather is warm enough, dig out the paddling pool. Once again, it costs nothing to have water fun and we regularly have ours out in the summer. The pool is a great way to have fun and keep children cool in the hot weather also. Water fights are even better and these needn't cost a thing by using jugs, cups and good old splashing hands instead. We even put our slide into the edge also to create our own water-slide which the boys love. Getting out and about is great fun, but it's even better if children can learn as your having a fun day out too. We love going to historical buildings, learning about nature and seeing beautiful surroundings. Local reservoirs are a great place to visit. 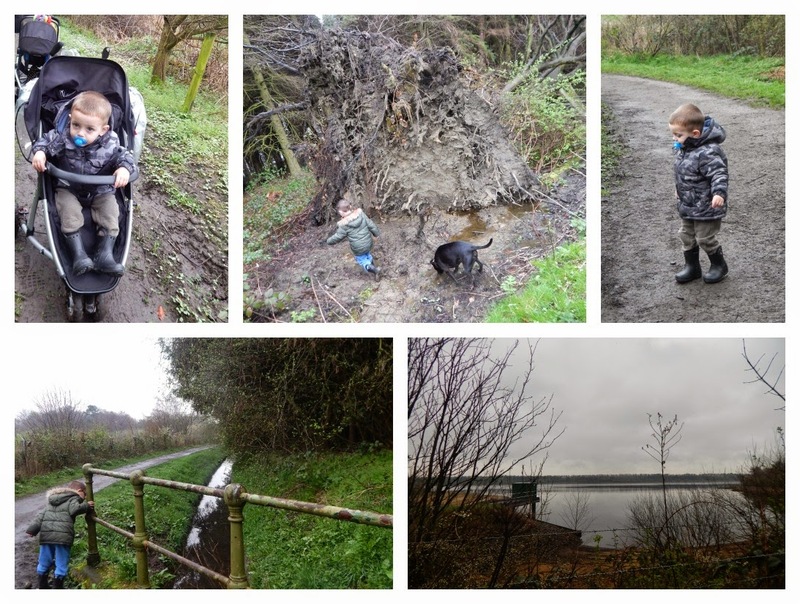 We went to our local, Eccup Reservoir (you can read our post here) and learnt all about birds, the water system and had a fun filled day. Yes, it was a really long day, a 7 mile walk left us feeling shattered at the end but it was a stunning place to see and the kids loved seeing all the nature. Old buildings are also great places to learn through play. Kirkstall Abbey, in the north-west of Leeds, is a ruined Cistercian monastery that has now been opened up to the public for viewings. Little sign posts all over explain about the history and what actually happened in each area. (you can read our post here). 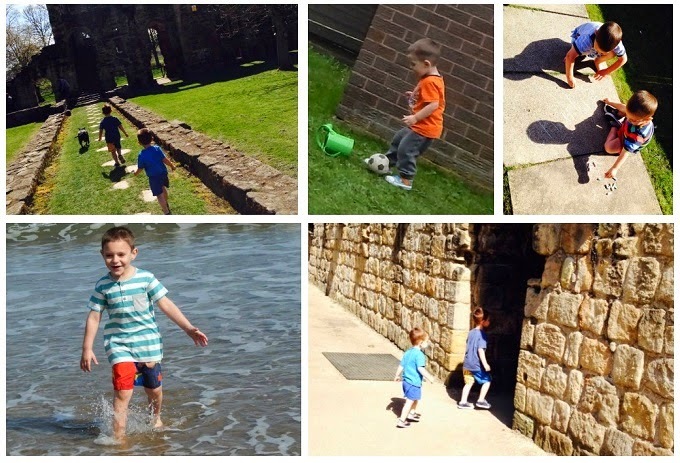 Not only can you learn about the Monastery but you can run, climb and play in the areas to keep learning fun. All these days out are super fun and cost nothing to do. You could even simply play football in the garden or at the local park or dig out your chalk and get sketching on the pavements. Days out don't need to be expensive, you just need to use your imagination and figure out how to do things on a budget. This week, we went out with my sister-in-law Nina and her daughter Laurel. 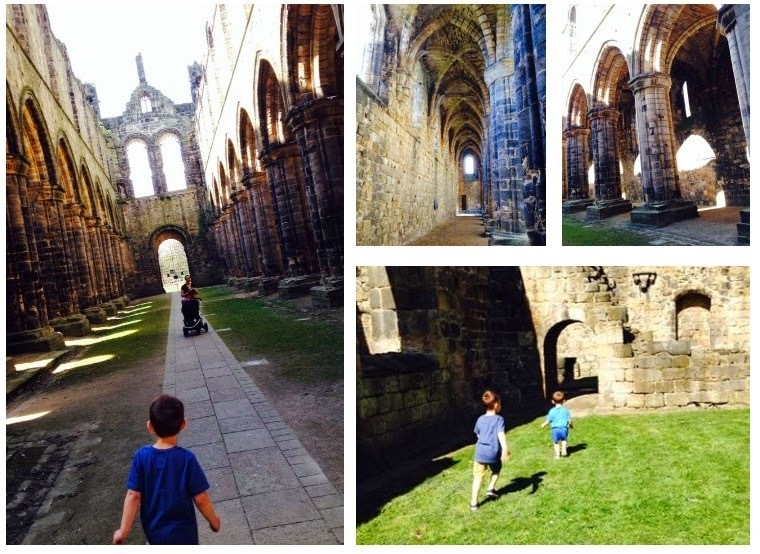 We visited Kirkstall Abbey so that the boys could see some of our local heritage. 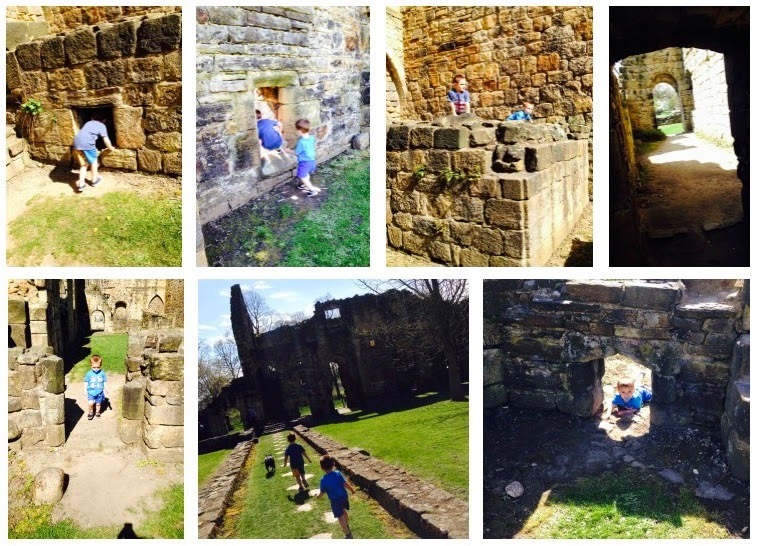 Kirkstall Abbey is a ruined Cistercian monastery in Leeds, not far from us. It is set in a public park on the banks of the River Aire. I remember visiting the abbey a lot when I was a child and wanted the boys to grow up seeing our local significant buildings, getting to learn about our history and also getting to play through learning too. The abbey itself is huge. You have to go through the visitor centre to get access to the inside of the building, but first of all, we enjoyed walking around the outside ad viewing the form of the abbey. It's a lovely walk around the grounds and you can even make your way right to Leeds City Centre by walking along the River Aire from here. Going through the visitor centre and into the abbey is a truly amazing experience. Before now, I have never been inside the building itself and getting to do some was such an emotional experience. The hard work, the architecture, the true scale of this monumental building is shown from the inside, but not only that. The ruins of the building and destruction are easy to see from the inside. Most of the abbey is open to the elements as it has no roof, stair cases are either eroded, damaged or not even there any more and there are random boulders of stone about that have fallen from the abbey in the past. Little posts around explained what happened in each aspect of the abbey. What it was used for, who would go there and how it was destroyed. There was also a very dark, quiet area where we could see religious people praying and such and so did not go in there as we didn't want to disturb them. The abbey is such a beautiful place to have the pleasure of getting to visit and we all had an amazing day out, learning about its history, viewing the ruins and getting to play a little too. Kirkstall Abbey is a Cistercian monastery. A Cistercian is a member of the Cistercian Order, a Catholic religious order of monks and nuns. The Cistercians were adversely affected by the Protestant Reformation, the Dissolution of the Monasteries under King Henry VIII. On 22 November 1539 the abbey was surrendered to Henry VIII's commissioners in the Dissolution of the monasteries where it was disestablished. Henry VIII was the Supreme Head of the Church in England which meant that he had the authority to do this. After this time, it was owned by various people and also got destroyed too, as much of the stone was removed for re-use in other buildings in the area. But in 1889 the abbey was sold to Colonel John North, who then gave it to Leeds City Council. The Council undertook a major restoration project and in 1895, the abbey was opened to the public to view from the outer edge due to it's unsafe buildings. After a £5.5 million renovation programme to make the building safe, the abbey was then opened and entry into the buildings itself was allowed. The abbey is a Grade I listed building and a Scheduled Ancient Monument (a scheduled monument is a 'nationally important' archaeological site or historic building). My 1st Years was founded in January 2010 when the founders realised that they couldn't find anything unique enough as the perfect baby gift. They realised that they had found a gap in the market for a new company that could provide baby gifts that were unique, fashionable yet affordable. From blankets, shoes, bears & simple accessories, the company grew and grew and now sources products for occasions too and, with Father's Day just around the corner, they have a great range of items perfect for Father's Day gifts. 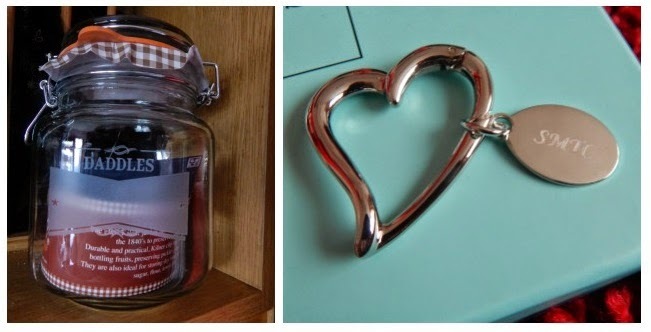 They sent us out 2 items from their ranges, a Personalised Sweetie Jar and a Heart Outline Keyring too. The retro style glass clip top jar comes with up to three lines of personalisation. It is very pretty and looks lovely in our kitchen. I have been meaning to buy my hubster his own jar as he does like his own sweets but have just never got round to it, now I don't need to. We have just got back from Scarborough and whilst there, my husband bought himself some brandy snaps. The jar is a perfect fit for them and will keep them fresh and away from the children also. It's £18 for the jar which comes personalised. I love the fact that you can have your own writing on it, from sweets to treats. This is a lovely heart outline keyring with a personalised disc. It is such a thoughtful gift as not only is it the heart shape to sow your love but the disc can be personalised to make it extra special. We had the initials 'SMTC' which are all 4 of our initials, on it and it is stunning. It is £15 for the keyring but that includes personalisation and it came in a solid My 1st Years gift box just to give it that special edge. There are loads of personalised gifts from My 1st Years so why don't you pop over to their website and check out what else they produce. I love Baby and Toddler Events. When I was pregnant, I would only ever go buying baby things when there was a sale on, as I could then get things a little cheaper. It meant that we stocked up on loads so never ran out of necessities like nappies and wipes. On the 17th April, Asda's Baby & Toddler Event starts and I will definitely be straight up there, stocking up once again. There will be hundreds of great products to choose from. George clothing, Little Angels products and even Little Tikes toys will be in the event. Asda's Little Angels range is fantastic. We buy nappies from there all the time. The quality is just as good as the big brands but they were better on the purse. They have soft and stretchy elasticated leg cuffs to help prevent leaks and breathable materials that help your baby stay dry all night long. I love Huggies baby wipes. They are thick and great for cleaning up any mess. When the event starts, they will be a box of 12 packs for only £8 which is fantastically cheap. 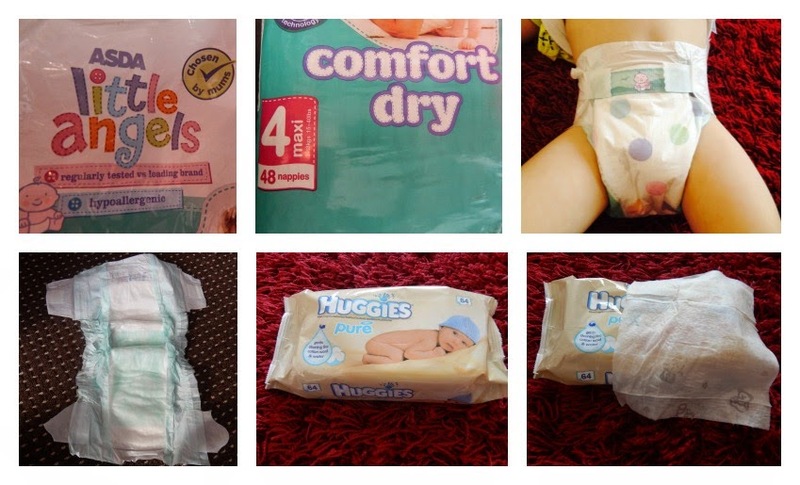 Huggies Pure Wipes are perfect for maintaining the natural perfection of your newborn baby's skin, providing gentle cleaning, just like using cotton wool and water. The Asda Baby & Toddler Event starts online on the 17th April and in store on the 21st. You can buy everything at the Asda Baby & Toddler Event, from car seats, moses baskets, nappies, clothing and much more, so get in store or online when it starts to stock up! I love flowers and since we have 2 big gardens, we decided last year, to plant some flowers. It was nice to see Thomas learning about flowers and how to plant them, water them and watch them grow when we got involved in the Kids Grow Wild challenge last year. That was until Charlie got a hold of the pots and emptied them all out before they had a chance to fully grow. So this year, we are going to try again, to grow some pretty flowers. Neon Jungle, the girl group, played a very special, exclusive gig to just a handful of fans on 6 April 2014 to celebrate the launch of Grow Wild UK's 'Let's Grow Wild' campaign. The gig took place on a London Bridge rooftop where teens learnt how to transform unloved urban spaces in the UK. 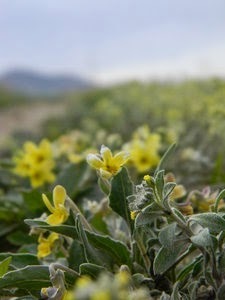 I love flowers and so have signed up to the Grow Wild UK Facebook page and requested our free pack of wild flowers to get us started on our flower garden. This year though, Charlie is older an understands more about looking after things. I am also going to keep them up high whilst they are first sprouting to stop little hands getting close. It will be great to see some lovely flowers growing in our garden and will mean that more wildlife will around our garden for the boys to see. I think we'll have to pop out and buy a few accessories that we will need to help with the growing process and then get growing! Finally, we got to go on our break. You really don't know how happy I am that we actually got to go. You see, Simon's colleague had already booked this fortnight off work which meant that Simon had to work this week. We had thought about cancelling the holiday altogether but, after much persuasion, Simon's boss said that he could take a few days off, as long as he got the weeks work done first. This meant that our Monday to Friday break was cut to Wednesday to Friday instead, but we didn't mind, as long as we got a couple of days away. So, rushing around to pack and booking last minute tickets from Red Spotted Hanky, which were surprisingly cheap, we finally set off to the station. Going from Leeds to Scarborough only took just over an hour and the boys loved getting to go on a train. Watching the other trains pass by, seeing the animals in the fields and hearing the train 'toot toot' was a young boys dream and both boys loved every minute of it. We then arrived in Scarborough Railway Station and just outside was our bus stop which took us straight to Cayton Bay, only a 10 minute ride away. 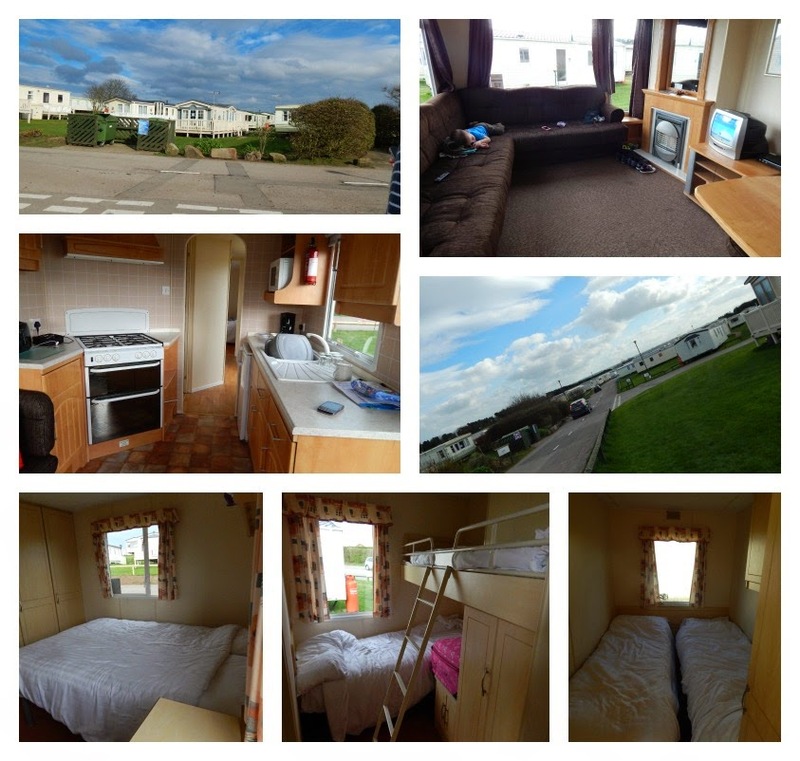 Cayton Bay is a caravan park run by Park Resorts. It is quite a small caravan site and being totally truthful, I was dreading arriving there. I had spoken to a few people about us going there and all I heard was bad things about it being small, nothing to do and a bit run down. Why people told us things like this before we went I really don't know, but it meant that we were expecting the worst. It was a lovely place. Yes, it was smaller than other caravan sites, but this meant that it wasn't as busy, queue's weren't as long and it was peaceful. I really don't know what all the fuss was about as, for the whole duration of our stay, I had nothing but praise for the place. Our caravan was fab. It had a spacious living room area which included the dining table and the kitchen came from there. 3 bedrooms and a bathroom were at the back of the caravan which were all space saving. I loved that they had worked in more space by making bunk beds in one of the twin rooms and that there was nifty storage everywhere around the caravan. You could even make it into an 8 berth as the sofa pulled out into a bed too. Everything inside that we would need, fridge, cooker, even a t.v. and the beds were already made, ready for us to jump into. A small t.v. in the living room gave the boys cartoons to watch on a morning before we started our day. The only problem we found was, when we entered the caravan, none of the electrics were working. Just our luck right?! But after a simple phone call to the reception, a maintenance man arrived within 5 minutes and had the electrics on in seconds. Choosing to spend the remainder of our first day in the complex, we popped along to have some tea. The restaurant was lovely and serving some yummy food. Simon had a grilled chicken burger whilst I had gourmet mini burgers and the kids had sausage. Whilst we were waiting for the food, the boys went into the soft play area which was great. 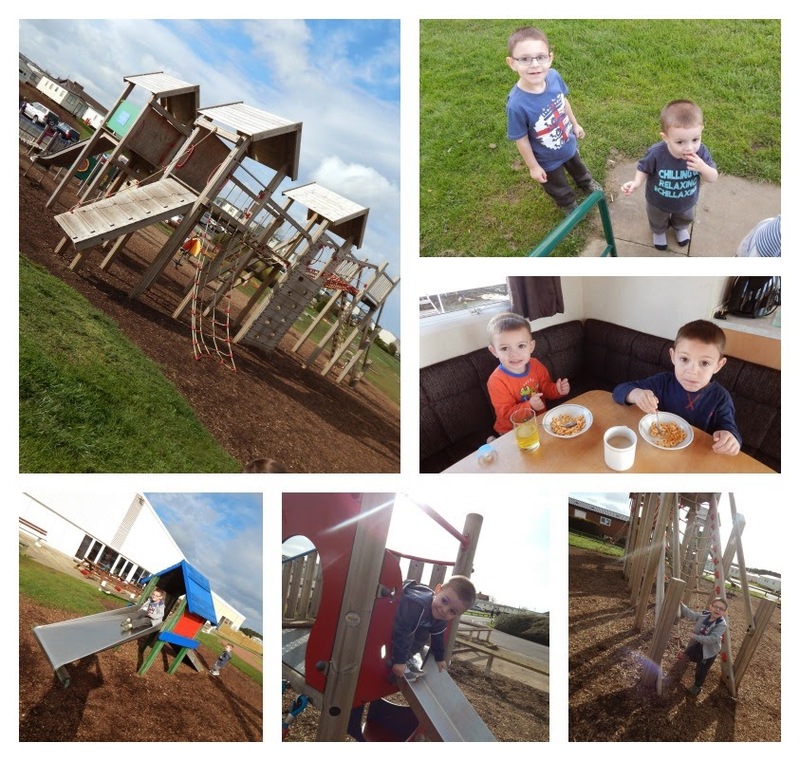 A huge area full of climbing frames, slides and all fun for the kids. Thomas loved that he could throw himself around and, since it was all soft, did not hurt himself. He took to siding down the stairs quite well! 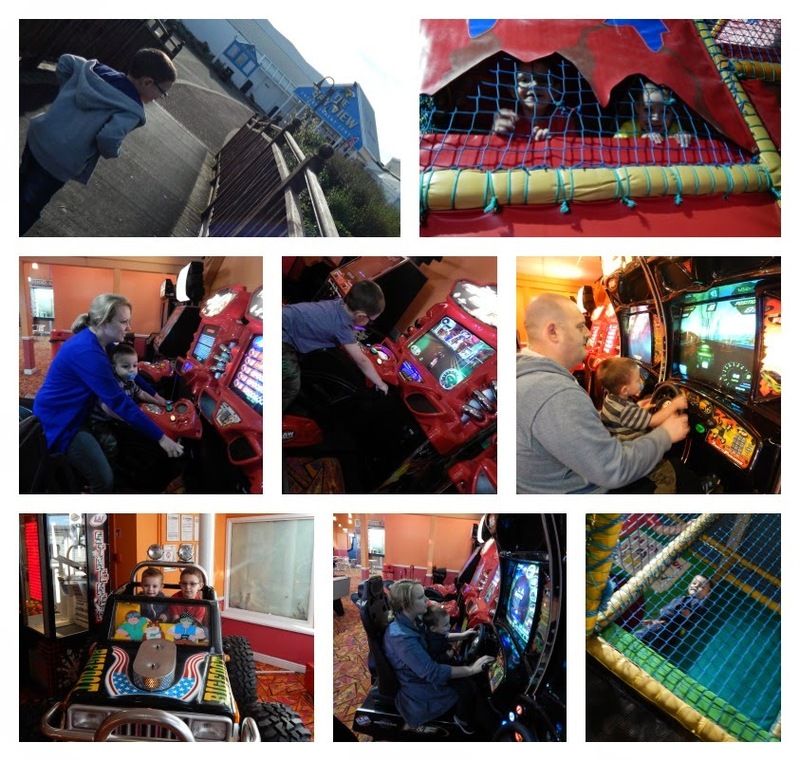 After the scrummy food, we went into the amusements and had a play before heading back to the caravan for the night. The first day was so shattering that we were all asleep early. On Thursday we went to the beach. 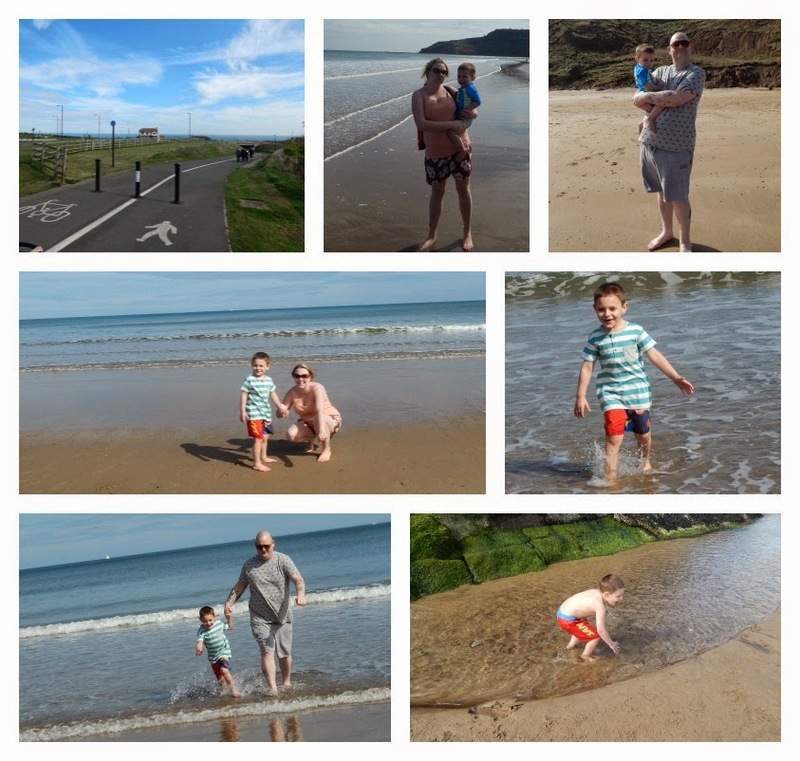 Luckily, it is only 5 minutes from Cayton Bay, just across a road and then down a very, very steep hill. When we finally made our way down, the view was wonderful. Such a beautiful beach where all the other Cayton Bay holidaymakers were enjoying themselves also. It was truly amazing, British weather at its best! We played all day, building castles and blowing bubbles and then finally made our way back up the hill to the caravan site to have a play in the park area before settling down for the night. Friday was our last day away, boohoo! but we made the best of it. Checking out in the morning and going for breakfast at the restaurant. We were all a little gutted that we were only there for a few days as there was so many activities to get involved in but we were too late arriving to book. You could have breakfast with Sparky and his Krew, make pirate ships and go on an adventure and even go swimming in the pool which had awesome slides. So many things that we missed out on but didn't have enough time to do. 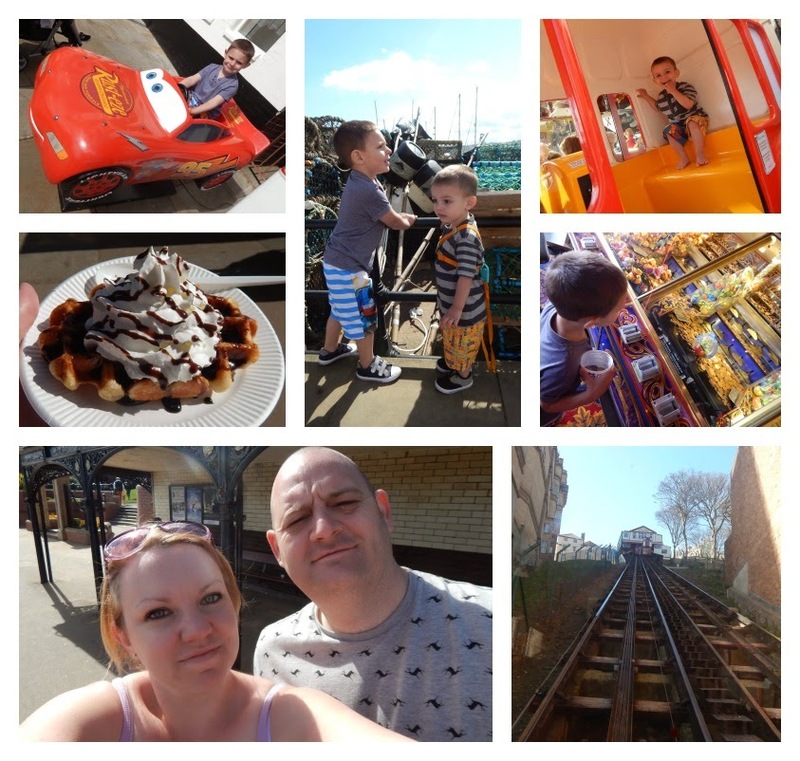 After having one last play in the soft play area, off we went to Scarborough for the day. I love Scarborough and have fond memories of going many times when I was a child. I know people love going abroad and seeing the sights, but I love our British seaside's, our heritage. We walked along the pier to see the lighthouse close up and see the huge gun that was found it the sea after World War 1, which my husband used to make rude gestures with! Hot dogs, burgers, fish and chips. We stuffed ourselves full and then filled up some more on delights. Doughnuts that were made fresh, right in front of us. Waffles, squirted with chocolate sauce and whipped cream and as many ice creams as we could fit in. Lovely! We then spent the rest of our time on the beach. Enjoying the gorgeous view and playing in the sand before going for the tram, to take us up the hill to go and wait for the train. After a few short days away, we arrived home. back to business as usual. 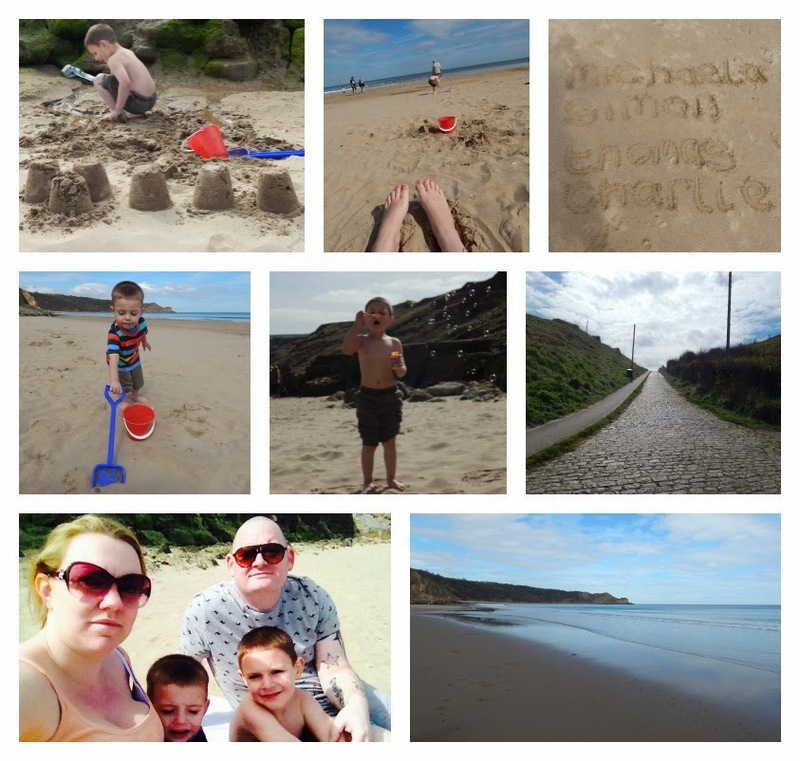 But dreaming of the lovely time we had and already planning our next break away to Scarborough again! Since it's the school holidays, I had been planning to get the boys out as much as possible, no one wants to be stuck in the house during the holidays. 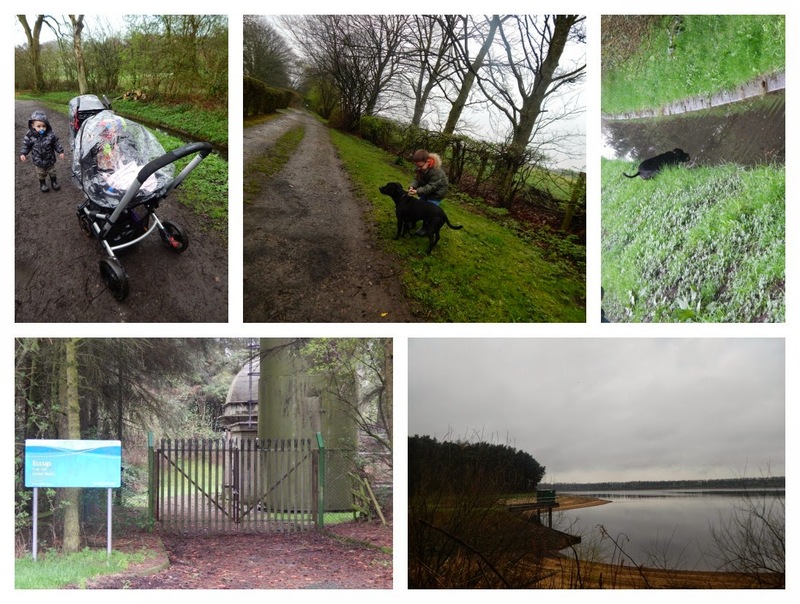 So, obviously when we got invited to have a stroll around one of Yorkshire Waters many reservoirs, I said yes. To document our visit, Yorkshire Water sent us a camera to take shots on and this came in great use. After having a looks at their walks and leisure guide, I finally settled on Eccup Reservoir. The woodland surrounding the reservoir is a Site of Special Scientific Interest and is nationally important for birds. The walk passes the village of Eccup, over a dam and alongside a local golf course and is 4.5 miles long. We went on Monday but my husband had to work, so instead, myself, Thomas and Charlie went with my sister-in-law, Nina, her daughter, Laurel and their dog, Diesel. It was a very full car, but we got there in the end and I'm glad that we all got to go. I must admit before we go any further, getting to the reservoir was a bit hard. It was about a 1/4 of a mile walk just to get to it from were we had parked and this crossed a golf course and very muddy pathways. It was beautiful when we got there though! Yorkshire Water provides households with an essential service. As one of the country's largest landowners they work closely with numerous tenants to capture rainwater in the best way - the minute it falls from the sky, so they can deliver the highest quality water possible to your tap. It's a huge operation and often taken for granted when you turn on a tap or flush a toilet. The rain water falls into the reservoirs and then is processed from there, cleaning and travelling all the way to our taps. Rather than keeping the reservoirs and there beautiful landscapes and structural features (such as reservoirs walls) under lock and key, Yorkshire Water open up the sites for everyone to enjoy. It's free entry, free parking and idyllic walking routes and there are so many to choose from. We always think that reservoirs are just a place to keep water, but their surroundings are just stunning. The greenery, the trees, the birds, just the whole experience of being outdoors, walking around something that powers hundreds of thousands of houses water supplies. Something that the whole lot of us relies upon. 2 adults, 3 children, 2 prams and a dog later, it was very hard work. I think we picked the worst day possible to go as the weather was horrendous. 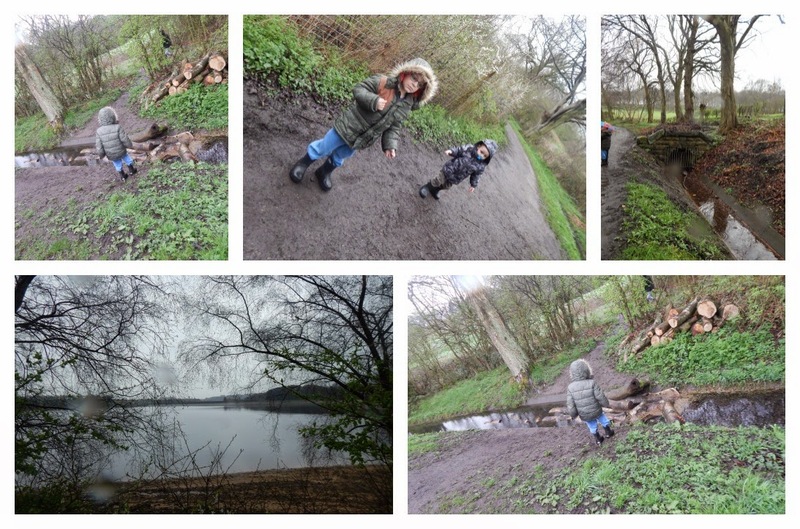 This meant that the walkways were even muddier than usual which was very hard to get prams through. We made it though, slowly but surely, we got there. Yorkshire Water make sure the precious resource of water is looked after from the water we drink to the safe removal of waste water. Allowing their customers to enjoy the beauty of these reservoirs empowers us all to take care of our little part of the world; playing a part in our Blueprint for Yorkshire! I am so glad we brought our wellies as, after a long day trawling through rain and mud, we were all pretty muddy!